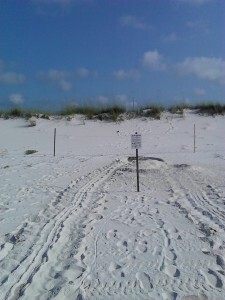 It is May and this is the official beginning of the sea turtle nesting season. These ancient creatures have followed this nesting cycle for centuries traveling the open ocean, feeding and resting on reefs, then returning to shore in the spring and summer to breed and lay their eggs on beaches and barrier islands. What is neat is that Dr. Archie Carr discovered they return to the same beaches near where they were born. So those visiting our beaches are in a sense, “our” turtles. Another interesting fact about panhandle sea turtles is that a significant number of male turtles are produced here. Gender in most turtles is determined by the temperature of the egg during incubation in the sand; colder temperatures producing males. Since the panhandle has cooler temperatures than the lower peninsula of Florida, we produce the majority of the males for our populations. This is also why we have fewer nests than south Florida, since it is the females who return to shore. Tracks left by a nesting Green Sea Turtle. Courtesy of Gulf Islands National Seashore. However, in the last 50 years more and more people have moved to the beaches and barrier islands of the panhandle and the sea turtles have run into problems continuing their ancient cycle. Four of the five species of sea turtles in the Gulf of Mexico are currently listed as endangered; the loggerhead is listed as a threatened species. Though they have issues with natural predators much of their trouble is due to human activities. HERE ARE FIVE THINGS YOU CAN DO TO HELP SEA TURTLE NESTING THIS SEASON. Offshore, more and more turtles are being struck by boats. These are air breathing reptiles and need to surface. Unfortunately nesting season is also during the height of fishing and diving season. Many boaters must follow no wake zones to reach open waters and want to open up the throttle when they do. As with manatees in our rivers we ask that you keep a lookout for the surfacing heads as you are heading to and from your destination. Both offshore and inshore sea turtles are encountering more plastics in the marine environment. Turtles become entangled in discarded fishing line and actually consume many forms of plastic debris drifting in the water column. One loggerhead found on Dauphin Island had 11 pounds of plastic lodged in its esophagus, which obviously kept it from feeding properly. When you go boating please develop some method of storing plastics and fishing line until you reach shore. Once you return to the boat ramp please use the fishing line recycle bins to discard your fishing line. Fishing line placed in these are recycled into new fishing line. If there is not a fishing line recycle bin at your boat ramp contact your County Sea Grant Agent to see if one can be placed there. If you are enjoying the beach from shore please discard of all solid waste in trash or recycle cans before leaving. On the beach many residents and visitors spend the day playing in the sand and building sand castles. This time long activity is great fun but leaving large holes in the sand when you leave has not only entrapped turtles but have been problems for turtle watch and safety vehicles using the beach. Please fill in your holes before you leave for the day. Another issue on the beach are chairs and tents left over night. Many residents and visitors staying on the beach for a week or longer like to keep their chairs and tents set up for the duration. However this has caused barrier, and sometimes entrapment, issues for the turtles. We ask all to remove these from the beach at the end of the day. And finally, the lights. 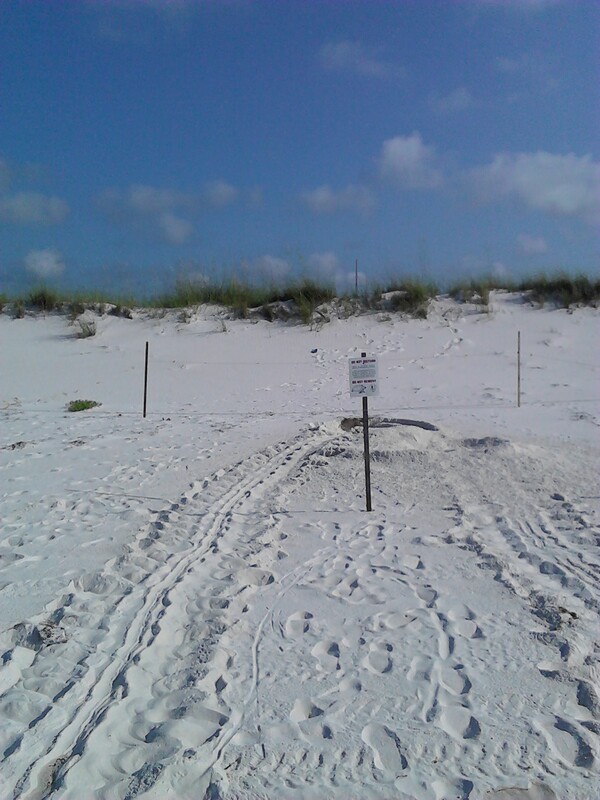 40-50% of our turtle nests in Escambia County are disoriented by artificial lighting. Most panhandle counties do have beach lighting ordinances. We ask both residents and visitors to become familiar with their ordinances and abide by them. Exterior lighting should be low to the ground, long in wavelength (yellow or red), and shielded to direct the light down. Interior lighting can be blocked by closing the shades, moving the light source away from the window, or simply turning them off. All counties’ ordinances have some version of these basic ideas. With a little help from us, our sea turtles can continue their ancient cycle. These animals are fascinating to see and for many, the highlight of their trip to the beach. If you have questions about sea turtle biology or the local lighting ordinances contact your Sea Grant Agent at the county extension office.